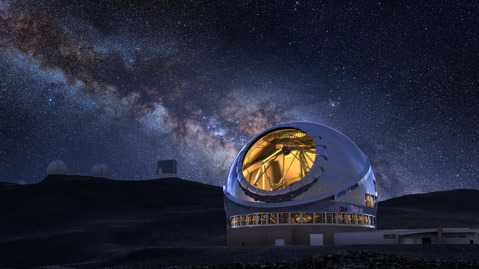 The proposed Thirty Meter Telescope (TMT) suffered a serious blow this week after the Hawaiian Supreme Court rescinded its construction permit. Plans to build the world’s largest telescope atop the Mauna Kea were put on hold in April after scores of Hawaiian natives protested the project, and environmental groups challenged the permit in court. UCSB Chancellor Henry Yang, a major force in the project who has chaired its board for eight years, has given little indication about what comes next. Proponents say the telescope — thirty meters in diameter with an enclosing dome and attached building — would allow astronomers to conduct cutting-edge research impossible anywhere else on the planet. In the works since 2000, the project combines the University of California, Caltech, and researchers from four countries — India, Canada, China, and Japan. Research teams have been manufacturing pieces of the observatory for some time. The University of Hawaii would sublease the land in exchange for time in the observatory. But native Hawaiians objected to another telescope — 13 currently exist — built on land deemed sacred and in a conservationist district. One opposition group, Mauna Kea Anaina Hou, filed a lawsuit against the state, arguing the Department of Land and Natural Resources (DLNR) erroneously issued the nonprofit corporation a conditional permit before hearing arguments from appellants. Kealoha Pisciotta, who is president of the Mauna Kea Anaina Huo, expressed joy and called the ruling “very significant.” “They can’t just operate as a rubber stamp anymore,” she said. “We’re an island nation that has limited resources.” Specifically, Pisciotta said there are five aquifers under the mountain. “Generally, no development is allowed to be built because it’s protecting the water sources for the whole island of Hawaii,” she added. TMT has consulted with many native Hawaiians and cultural practitioners since 2004, according to Michael Bolte, a UC Santa Cruz professor who sits on the TMT board. Last year, TMT pledged to pay $1 million each year in community benefits, including funds for Hawaiian students to study STEM education. In 2003, UC, Caltech, and NASA faced similar scrutiny from native Hawaiian groups in court after the partnership proposed the Outrigger Telescopes Project on the same mountain. Similarly, a judge reversed a permit issued for it. The telescope was never built.